Search marketing swag is awesome! I have accumulated a ton of swag over the years, and have started a fun new experiment on Facebook and Google+ where I share my “Search Engine Swag” of the day. Make sure to follow PPC Ian on Facebook and Google+. My first Search Engine Swag is my cool Yahoo! basketball. Honestly, Yahoo! has some of the best account management in existence and our AM team always thinks of us. When I’m pondering big new ideas, you can often find me bouncing my Yahoo! basketball. I’m not going to add new swag every single day but you’ll find me posting cool new items every few days. Do you have a favorite piece of Search Engine Swag? I’m so excited for the long weekend. I have a long four-day weekend here and I’m totally thrilled. I’m taking time to really enjoy the weekend with my amazing wife, Nicole. We both work super hard and are thrilled for some time off. I know the folks on my team and pretty much everyone I know in the digital marketing industry works incredibly hard (that’s you). 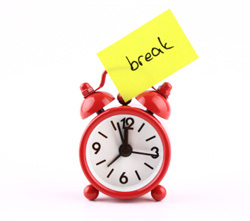 Make sure to take it easy this long weekend! And, make sure to say thanks to everyone who has made our country so special, we are truly fortunate. Make sure to thank great people in the digital marketing industry. Do you have a partner or vendor who treats you well? Take a few minutes to write thank you emails. Maybe call them out on Twitter. Make sure the thank you emails and words of praise go to your day-to-day rep and also the senior leaders. Call out success and make others look good. If you pause and take time to celebrate the success of others, you will make someone’s day each and every day. What’s better than that? I’ve been in the digital marketing game since 2004, loving every step of the way. I was discussing with a co-worker on Friday that I’ve now been doing digital marketing for longer than I was in college and high school combined. That’s almost unbelievable, it’s gone by so fast. Digital marketing is intense, never forget that this is your life. Take it all seriously, but never forget to have fun each and every day. Never forget to force everyone on your team to have fun each and every day. As a leader at your organization, you have the opportunity to add great value and impact not only to careers but lives as well. Treat your team at work like family. You are there to empower and uplift others. Likewise, look to your team for strength and motivation. The power of a team is so much greater than the sum of the parts. Find ways to build an incredible presence of strength, confidence, and results as a team. Digital marketing, at an enterprise level, is definitely not a solo sport. That’s all for today everyone. 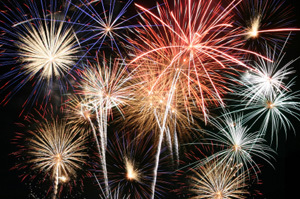 Wishing you a fun, happy, and safe 4th of July. I truly appreciate your support! PPC Ian is now a registered trademark of my company, IJL Productions LLC. I’m thrilled, it’s the first trademark that I own and represents my goal of continuing to go really big with PPC Ian! I truly appreciate each and every person who takes the time to read my blog, thanks so much. Nicole and I had dinner with a great friend tonight who we had not seen for a year! 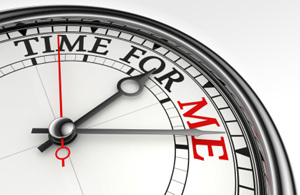 Time passes by so fast, especially in the world of online marketing. Make sure to take time for the important people in your life. It’s all about friends and family. This weekend, I’m working most of the weekend. I have a big presentation on Monday and want to make sure it’s perfect. I worked half of the weekend last weekend too. It’s all about doing your best and going above and beyond in your online marketing career. 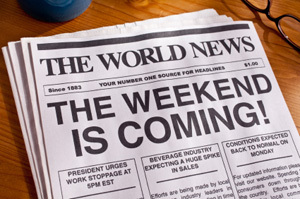 Next weekend will be my time to take some time off! I removed all non-converting affiliate links. Even though the links were marked as “nofollow”, I saw no reason to keep such links if the were not driving sales. I made sure all links worked. I corrected or removed broken links. I found lots of them. I also made sure to check the websites I linked to. Some of them were gone and were simply parked pages. I made sure to remove such links, as they are no longer of value to the user. I updated all copyright notices to say “Copyright XYZ Date – 2012”. Many of them had only been updated through 2011 or in some cases 2010. The combination of these efforts seems to be helping quite a bit. My traffic is steadily increasing and also my AdSense earnings are up about 25% over the last few weeks. It’s important to simplify your life and focus on those things that are truly important. This type of framework can help both at work and at home, it’s a big productivity and peace of mind booster. Recently, I dropped a lot of domains. I’m even dropping domains that have built websites, if they are not earning good money each year. Why keep domains/websites that don’t pay for themselves (and that I have no intent/ability to sell for a profit)? Such domains/websites are liabilities, not assets. This move has helped clear my mindshare while also boosting profits. It’s just like paid search optimization, you need to invest in your winners and cut your losers. PPC tip of the week: Make sure to ask your search engine reps about beta tests. Beta tests are a great way to stay ahead of the curve and embrace new technologies before anyone else. Moreover, betas often offer a discounted (or even free) way to test features that may later cost money. My amazing wife, Nicole, took me to Yoshi’s San Francisco to celebrate my promotion (we’ll get to that next) last night. We had an amazing dinner and then saw one of my favorite jazz artists, Najee. The concert was totally amazing. While Najee is one of my favorite jazz artists (I have been listening to him since his 1992 album Just An Illusion), I had never seen him in concert before so last night was a real treat. 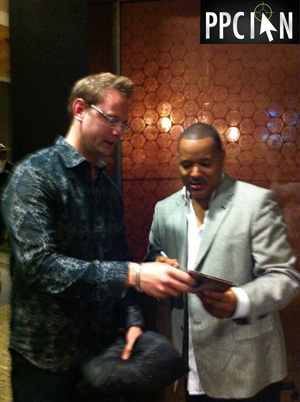 I also got to meet Najee after the concert (pictures to the right and below) and also got my CD signed. 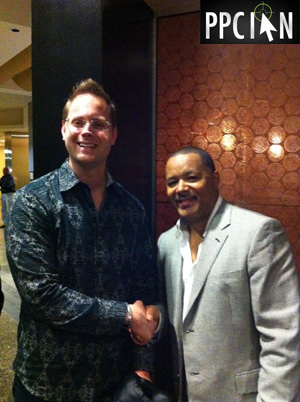 As someone who has been truly inspired by Najee’s music for many years, this was the best gift ever, thanks Nicole! In late March, my lifetime goal of reaching VP was realized. I got promoted to Vice President, Search Marketing and it as been a true honor. My new role is everything I imagined and so much more. I feel a deep sense of responsibility and am so thrilled with everything I’m doing. I’m extremely thankful as the honor would not have been possible without an unparalleled team and company, amazing co-workers and mentors, and of course my amazing wife and family. I had so much fun on Friday! 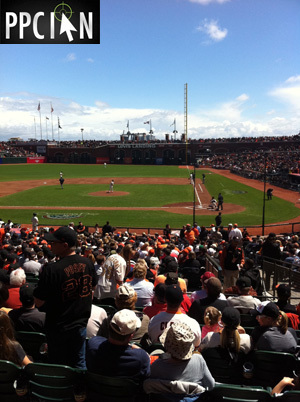 I attended the Giants/Pirates game at AT&T Park with my co-workers. We had really great field club seats (picture below). The Giants won the game and the weather was perfect. It’s so exciting that baseball season has started. Just a few weeks back, I attended the Warriors/Lakers game with co-workers as well. Sporting events are a great way to enjoy the company of co-workers while relaxing after work. Google+ is taking off! If you don’t have a business page on Google+, make sure to create one. Google+ is showing up in organic search results and also paid (right rail) from time to time. I’m going to get some screenshots and do a future post on this topic, but long story short it is the perfect time to invest in your Google+ business profile. I really enjoy public speaking! Last Tuesday, I spoke on a panel at SVForum’s CXO Forum at Sheppard Mullin Palo Alto about Marketing In The Digital Age. This was an amazing event and truly distinguished panel. I was humbled and honored to be on such an incredible panel. Moreover, I was dazzled with the high caliber C-level audience. My advice to those in the corporate online marketing career path: Go after public speaking events, they will grow you as a person and as a leader. It’s all about connections. How did I get the speaking opportunity on SVForum’s CXO Forum? I was recommended and referred by a friend/co-worker who has some seriously impressive connections. It’s really important to build strong connections. Also, it’s important to make your connections your friends and, of course, make sure to pay them back (or even better pay them forward) whenever you can! Everyone wins! I’m intrigued by customer testimonial marketing/product marketing (mainly becuase my wife is an expert at this stuff), and had the amazing opportunity to do a Video Testimonial for Marin Software. I’m really pleased how it turned out. Not only is their product amazing, but Marin has a world-class marketing team (and video production team). Thanks, Marin for the opportunity, you rule! You can’t do it on your own! I have had some incredibly difficult decisions over the past few weeks (in a good way). I wouldn’t be where I am without my wife, family, friends, and mentors. Also, I have been following a lot of inspirational folks on Twitter such as Diddy and Rev Run, and their Tweets have been truly inspirational. Find your sources of support and inspiration. Become a source of support and inspiration for others. Stay inspired, stay on your game! One of my big 2012 Goals is donating a record amount to charity. Today, my wife and I cut a check to Second Harvest Food Bank that’s 300% the amount of any other single donation we’ve made in our lives. It felt good. There is no reason that anyone in our community should go hungry. Get out there and help those in need of assistance! About a month ago, I Was Live on the Radio. My good friend Donald Landwrith hosts an amazing show called The Free COO. It’s an amazing show, and quite inspirational. Thanks for reading! You may want to also check out my the first edition and second edition of my musings. Wishing you an amazing week! I hit the 200 post milestone here on PPC Ian. This post is actually number 202. My post about Epik, The Most Comprehensive Registrar Around was number 200. Now that I’m blogging more frequently than ever, I’m going to hit 300 and then 400 posts before I know it! Lending Club (affiliate link) is awesome. As you may know from my 2012 Goals, this is my year to save money, invest wisely, and also give back to others. Part of my savings and investing strategy involves Lending Club and I can’t wait to write an entire post about my strategy next week. Quick preview: I’m now invested in 140 notes with a net annualized return of 13.08%. Also, this is a great way to help and give back. I’m lending money to people who need it, and I’m offering a much better interest rate than they can get at the bank. VaultPress is a really great WordPress plugin. I was reading about the best WordPress Plugins For 2012 over on my friend Morgan Linton’s blog, and noticed VaultPress on the list. I had been thinking about getting this plugin for a while, and finally went ahead and did it after reading Morgan’s post. My HostGator VPS Hosting already has me covered, they do regular backups of my site. However, I like the extra peace of mind VaultPress offers. For $15/month, it’s great to know that my blog is being backed up continuously. When you think your pay per click accounts are fully optimized, think again! Even the oldest and most refined AdWords and adCenter accounts have more room for optimization. Sometimes I feel like I’ve looked at an account for so long that it’s perfect. However, when I take a step back I always end up finding more opportunity. I got a lot done in the last week. My strategy: Focus on completing one major task each day. I have an overwhelming number of projects on my plate. By staying focused, I’m thankfully making some serious progress on my list. I’m super excited about my Twitter Advertising Challenge. I’m basically challenging myself to take my Twitter account to the next level. I’ve already made great progress and can’t wait to finish this project. So far, I’ve reduced the number of people I’m following by 3,000+ and have been working with my designer on a new background (it looks amazing so far). After my Twitter Challenge, I’m going to do the same thing on Facebook. I already have some really great ideas to take my Facebook Fan Page to the next level. It’s taking a lot of time to update the copyright notices on my 120+ websites to reflect the new year (2012). I haven’t gotten through all of them yet, but have updated my most important sites to include 2012 in the copyright notice. My good friend Morgan Linton has one of the absolute best blogs on the Internet (if not the best one) about domaining. I have been reading Morgan’s blog forever and frequently commentate there. One of my favorite posts he does is his weekend musings (here’s a link to Morgan’s most recent Weekend Musings). Also, my good friend Jason Thompson has an amazing blog about domaining (on a Dot Co domain name) that I read every single day (I can’t get enough of it). Jason also frequently writes about his weekend musings. The week is so hectic that I too like to reflect back on things and think at a higher level during the weekends. 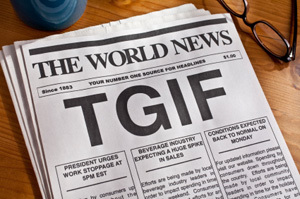 Today is my first weekend musings post, inspired by Morgan and Jason, the first of many! It’s really hard for me to say “no”. Sometimes I wish I did a better job at this. That said, I’m an ambitious guy and want to do it all. If you’re waiting on my for something, hang tight, I will get through everything. So many amazing things to get through in 2012! I Worked This Weekend again! I didn’t work all day Sunday, but worked all day and night Saturday. It honestly felt like all weekend, however, because I slept half the day today recovering from my big day yesterday. I had an important deadline that I just had to hit (others depended on me). It’s the beginning of a new year and I’m trying to start the year aggressively. I don’t plan on doing this every weekend, but the beginning of the year is a good time to invest the extra hours, in my opinion (since you enjoy the benefits of the work all year and beyond). I really enjoy working on SEO, as much as paid search. The project I worked on all weekend was actually an on-page SEO one which is quite fun. My advice to those in the PPC career path: Explore related fields such as SEO, display, email, and affiliate marketing. You don’t have to spend a ton of time, but even a small amount cross-channel experience will add greatly to your perspective. Posts about commentating get a lot of interest. I decided to write my post about how Blogs With Top Commentators Are Now Rare as a follow-up to my very popular Blog Commentating Strategy. My new post got a lot of comments and interest. This just goes to show that I’m not the only one who’s passionate about commentating. I’m starting to see Six Sitelinks show up on my paid search ads, not only for trademark/brand keywords but for generic keywords too. Make sure you have at least six sitelinks deployed in each of your Google AdWords campaigns. SMX West San Jose is coming up in late February. If you haven’t registered yet, I highly recommend doing so. Here’s my recap of SMX West 2011. I’m particularly excited about joining my friends at Marin Software for a San Jose Sharks game after the conference. Hip hop is the best. I keep discovering great tracks. I’m listening to this Slum Village track right now called “Hold Tight” that features Q-Tip. I really want to see Q-Tip / A Tribe Called Quest in concert one of these days.